The Dancing With The Stars Season 18 official wrap party was held last Tuesday night at Riviera 31 of the Sofitel Hotel Los Angeles at Beverly Hills. The winners Meryl and Maks were not at the party, because they had to be quickly whisked away to LAX to fly to New York to appear on the morning shows, including The View. Meryl Elizabeth Davis is an American Olympic Champion figure skater. She now has a new trophy to put on her award shelf. Born on New Year’s Day in 1987, Meryl won a mirror ball trophy to sit next to her gold medal she won in Sochi at the 2014 Winter Olympics with ice skating dance partner Charlie White. Maksim “Maks” Aleksandrovich Chmerkovskiy is a Ukrainian Latin Ballroom dance champion, choreographer, and instructor. This is his first mirror ball trophy. Born on January 17, 1980, Maks began dancing at the age of four with his brother Valentin. Both became champion dancers and own dance studios in New York city and surrounding areas. The celebrities that excitedly attended included Karina Smirnoff, Billy dee Williams, Cheryl Burke, Kim Johnson and Danica McKellar. 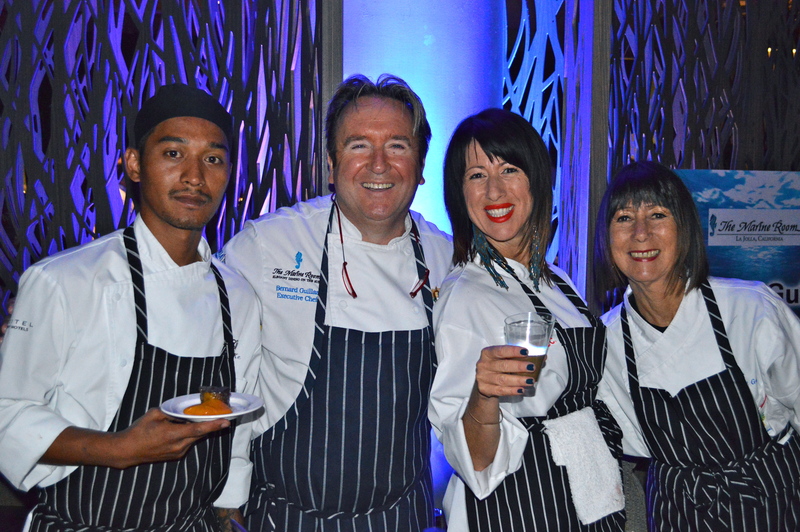 Blendtec and Chef Scott Fisher enhanced the party by assembling an all-star lineup of culinary talent to cater the event serving up an array of creative and cutting edge cuisine. Scott Fischer, who boasts over 35 years of experience in the food, entertainment, restaurant promotion and culinary industry, lead and produced the unique culinary event. You may remember Fischer in the Season One Fox Mega-Hit show, MasterChef. He was a contestant. Fischer has been a guest on Every Day Food & Cooking Today radio show on the Martha Stewart Living Radio Network/ Sirius-XM. He teaches a Culinary Program for Sur La Table and Williams- Sonoma. After the MasterChef show, Fischer became a Chef/Partner of Wicked Awesome Snack Bar/Café; Boca Raton, FL. He is the Founder and President of the Chicago-based company, The Single Gourmet, an international social dining club and the Founder and President of – Just Hatched Cookie Company, specializing in premium “brown butter” based cookies. This talented chef has cooked with Paula Dean and Michael Simon. Since he uses Blendtec professional blenders, they contacted him to work together. Blendtec is a sponsor of DWTS. 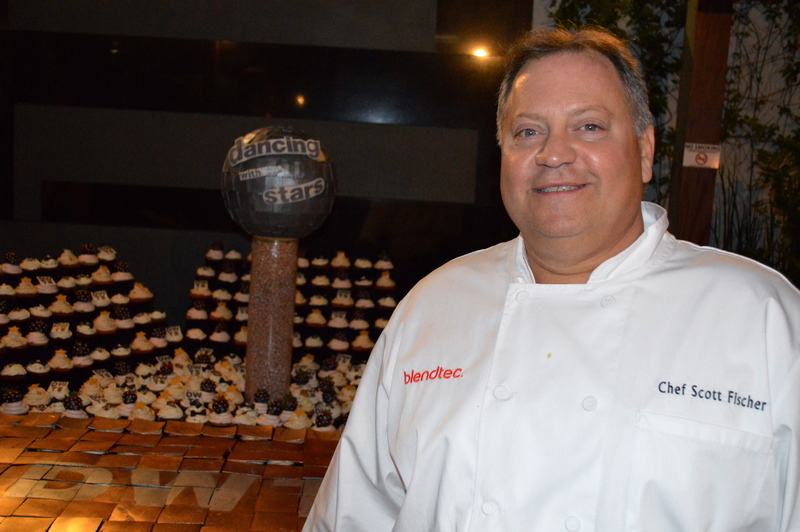 Fischer was recommended by Blendtec to be in charge at the Dancing With the Stars Wrap Party. He eagerly put together a unique culinary dream team that included Whitney Miller the winner of Master Chef Season One and teammate Avis White. White made a Louisiana pan-fried chicken, Andouille and sausage Gumbo, corn bread soup over rice. Also, Mario Cassineri from Bice and Cris Patolot made the amazing Dancing With The Stars cake. Chefs Bernard Guillas and Ron Oliver of the renowned Marine Room restaurant at The La Jolla Beach and Tennis Club in La Jolla, California helped out too. They had their Flying Pans: Two Chefs, One World on hand for guests to look at or purchase. Chef Bernard Guillas made a delectable vegan dish with Danica McKellar in mind, because she is a vegan, so he prepared a King oyster mushroom soup. “Danica McKellar is related to one of the owners of Marine Room. The chefs were going to prepare short-ribs for tonight, however when Danica broke a rib, they changed the menu to beef cheeks, in honor of her sweet cheeks,” said Fischer with a smile. All courses including Cocktail, Appetizer, Entrée and Dessert- were prepared with the use of a Blendtec blenders. Blendtec designs and manufactures the world’s safest and most powerful high-speed commercial and residential blenders. All Blendtec blenders are designed and assembled in the USA at the company’s Orem, Utah facility. For more information visit http://www.blendtec.com. Fisher also asked three of the top Disney chefs to help out. They created an upscale BLT with a heirloom tomato soup. The grilled cheese sandwich was on a brioche with avocado. Chef Scott Fischer deserved a mirrored ball trophy for calmly creating such a festive culinary adventure for the DWTS cast members and their friends and family.